Well, if this isn’t proof that you should never say “never,” we don’t know what is. That’s right, in 2017 Ayreon is going to be LIVE ON STAGE in a full-on rock show extravaganza. It’s two nights only, 15 and 16 September 2017 at 013 in Tilburg. We’ve been plotting, planning, and scheming to put this show together for full year already. It’s been excruciating to keep the secret, and it’s a huge relief to finally be able to share the news with you. 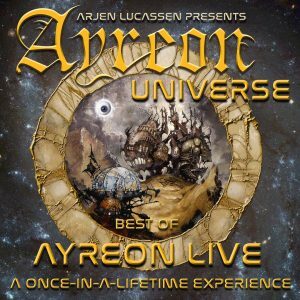 The Ayreon Universe live shows will feature songs from all Ayreon albums (incl. from the upcoming release on Mascot Label Group), plus a few fan favorites from Star One. The show is being organized by Arjen personally, assisted by Joost van den Broek, whom you know from his appearances on Ayreon and Star One, as well as his involvement with many other musical projects. Floor Jansen (Nightwish), Russell Allen (Symphony X), Damian Wilson (Threshold), Hansi Kursch (Blind Guardian), Tommy Karevik (Kamelot), Marco Hietala (Nightwish), Jonas Renkse (Katatonia), Mike Mills (Toehider), Anneke van Giersbergen (The Gentle Storm), Marcela Bovio (Stream of Passion), Irene Jansen, Robert Soeterboek (Star One), Edward Reekers (Kayak), Jay van Feggelen, Magali Luyten (Nightmare) and Lisette Marije (Scarlet Stories). The Ayreon Universe Band, hand picked by Arjen himself, includes Ed Warby (drums), Johan van Stratum (bass), Marcel Coenen (lead guitar), Ferry Duijsens (guitar), Joost van den Broek (keyboards), Ben Mathot (violin), Jeroen Goossens (flutes, woodwinds) and Maaike Peterse (cello). To top it all off, Arjen will be performing as well! He is not a fixed member of the Ayreon Universe band, but will be bringing his guitar along and will join the band on stage for a bit during the show. Basic info is below, but be sure to visit the Ayreon Universe website for all the particulars. The VIP tickets include an early entrance and a goodie bag with exclusive Ayreon Universe merchandise. Looking forward to seeing you all at the show for what is sure to be an AMAZING FLIGHT through the Ayreon Universe.